Read the last chapter first and you'll understand the purpose of this book. 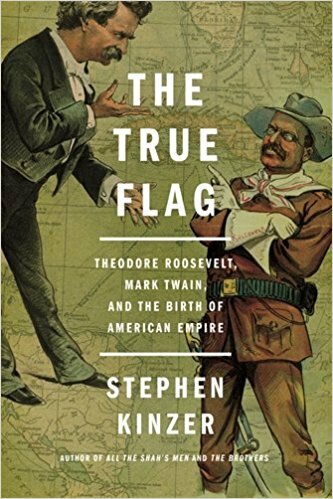 A screed against "imperialism" (as practiced by the United States) this book by Kinzer simply finds fault with the entire way the United States works overseas, starting with the Spanish-American War. Kinzer creates two caricatures to do this. One is Teddy Roosevelt, whom is shown to be a single-minded militarist and animal murderer who uses hunting and military service to feed his toxic 20th Century... er, 19th Century... masculinity. On the other side is Mark Twain, portrayed as a humorist and literary giant opposed to Americans sticking their noses in other people's business. Imagine a Jimmy Kimmel with long white hair and the ability to make people laugh. These two jousting dummies are bit two-dimensional in the book. For instance, Twain himself served as a Confederate soldier, however briefly, during the Civil War (but then again, I understand Jimmy Kimmel was the host of something called the 'Man Show'), a fact that he made light of later in life. Roosevelt's adventures in the West made him an ardent conservationist; later he would establish the very first national parks and national monuments within the United States. The "leap" to overseas expansion is portrayed as practically something that came about as a "spur of the moment" event. However, this ignores over 25 years of civil unrest and insurrection in Cuba, practically at the doorstep of the United States. Americans were interested in the liberation of Cuba well before 1898, as newspaper articles bear out. Kinzer, however, mentions Mahan's work on seapower's effects on history without ever having read it. The United States had no choice but to sieze overseas bases for coaling (like Hawaii) and to deny other bases for Spanish use (like Puerto Rico). Think what you will of Roosevelt's cause, he believed in it enough to put himself at the forefront of the fighting... literally. With his history of public service he had no need to get a commission in the Army to fight, but he went to war in a volunteer regiment. Twain, for his part, was a great writer and he put his pen to good use, questioning the motives of the men who sent America to war. But, Twain could afford to be nonchalant about matters of public service, never having run for office himself or accepting a government position. It's a lot easier to criticize, yes, and make fun of, than it is to govern. Really, the book is tiresome reading. I admire both Teddy Roosevelt and Mark Twain, although for different reasons. I'm not interested in taking side one against the other, which the author does.